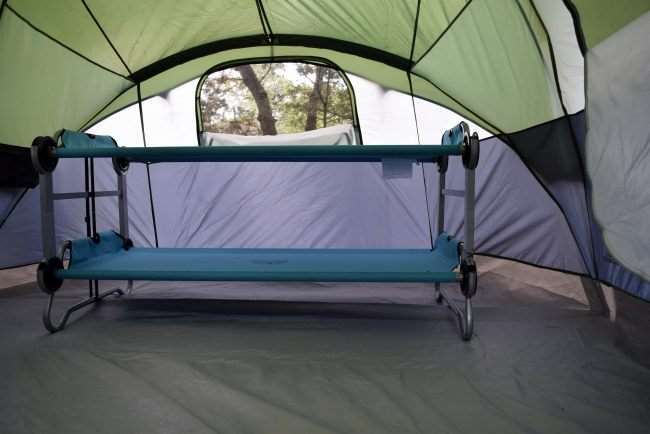 These portable kid bunk beds are, seriously, the best travel/camping gear for kids. The Kid-O-Bunk is a lightweight 3-in-1 mobile system designed specifically for kids. 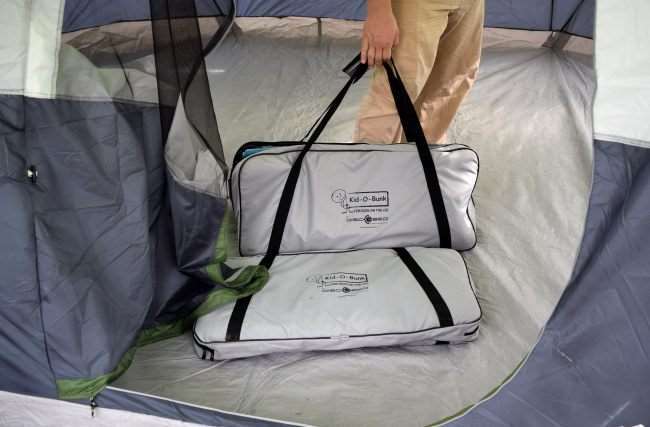 It’s designed to be perfect on camping, hotels, or sleepovers at home. Its design and convenient carry case make it easy to take with you anywhere. I was recently sent a Kid-O-Bunk to try out on our latest camping trip. My kids loved its uniqueness and I loved the space it freed up in the tent. We could actually move around without stepping on anyone. I really loved this product and I think you will too! With Kid-O-Bunk system, you get 2 kid bunk beds/ cots with a sleep area of Length 62” Width 27.7” each. Each cot comes in its own padded carrying case where all of the pieces are held securely in place with elastic bands sewn into the bag. The external handle is sturdy and makes transporting them very easy. 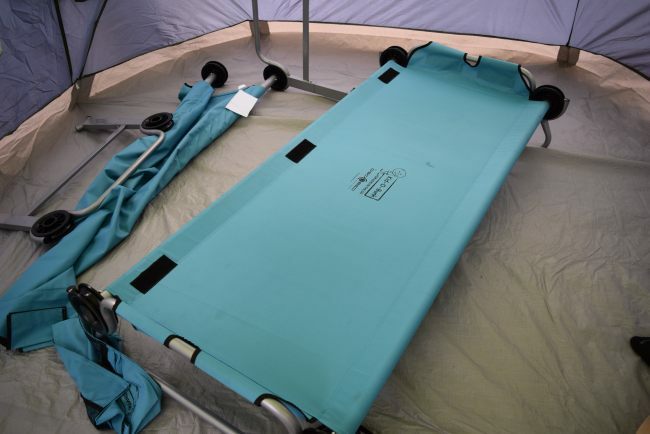 The cots are ideal for children ages 7-12. You can can be used separately, convert into a couch, or stack on top of each other for space saving kid bunk beds. When stacked together, the top frame fits securely onto the lower frame and adjustable straps hold each side together. The bed frames are lightweight and very durable. They are made of a powder coated, anti-rust steel. The cot fabric is a high quality, washable polyester. So they will hold up to children and all their activities. Each bed will hold up to 200 pounds of weight. I napped on the bottom bunk and (at only 5’2”) found it VERY comfortable. Each bunk/cot includes a detachable (Velcro) storage compartment. There are areas for a water bottle, 2 zippered mesh bags, and an open pocket. The Kid-O-Bunk system is very easy to put together with no additional tools. It can be done with 1 or 2 people and easy enough the kids can do it. You can configure the beds to be two single beds, a bunk bed system, or a couch. When the beds are separated into 2 beds, there are plastic inserts that fit into the bed frame to prevent the metal from touching/scratching the floor. When set up as a bunk bed, the top bunk frame fits securely above the lower bunk and a safety strap holds the cots securely in place. Like I mentioned earlier, we took these bunk beds camping. I loved that it freed up space for us in the tent. I was able to position the system near the side of the tent and it only took up the space of one sleeping bag. That left us with more space to walk around and the area under the bottom bunk was great to store gear. 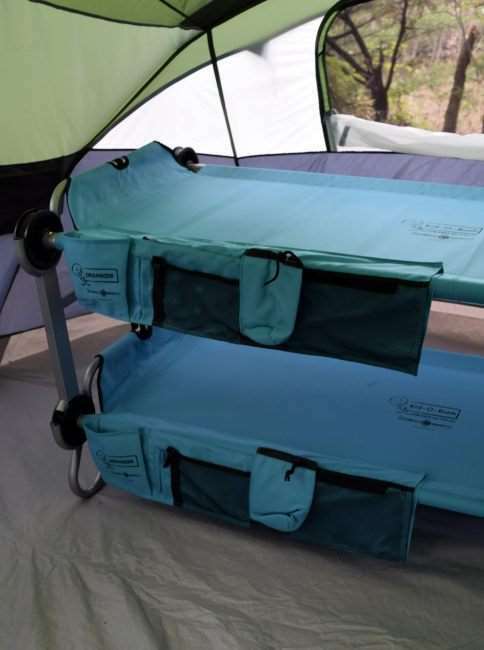 We are actually looking at purchasing the full size version for my husband and myself before our next camping trip. These bunk beds have more uses than just camping. My kids’ friends are excited to spend the night soon and sleep in the cots. They loves the idea of “camping” in the house (their words). You could also use these while traveling. We travel with 5 people and often hotel rooms can’t always accommodate us. Now, it’s no longer a problem. We can now bring the extra bed with us. 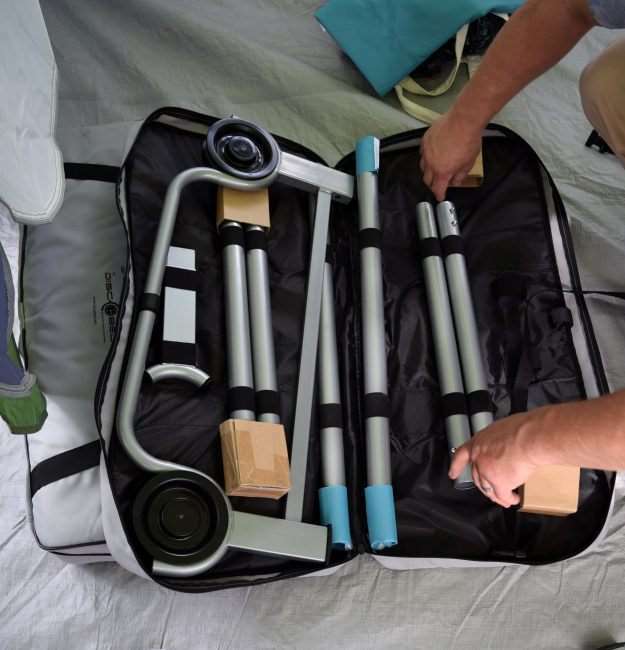 If you are looking for a portable travel bed system or just something for the kids, take a look at Kid-O-Bunk. Visit the Kid-O-Bunk website for more information or to purchase one for your family today! Below is an affiliate link for Amazon. When you purchase thru this link, we receive a small commission at no cost to you. Disclaimer: I received a Kid-O-Bunk at no cost for the purposes of this review. All opinions expressed, as always, are 100% my own. 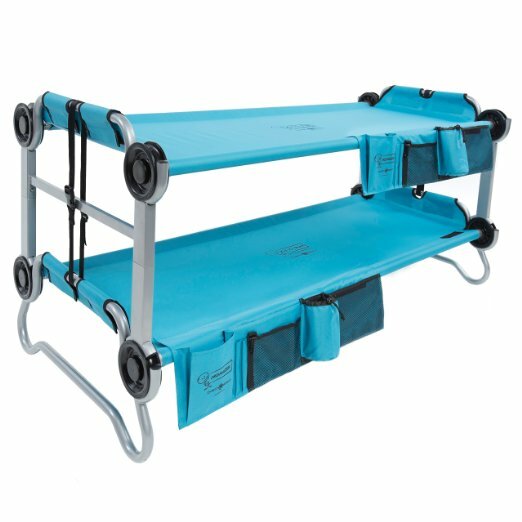 I want to give my 2 cents on the Disc-O-Bed Cam-O-Bunk Cot (http://campingandcamping.com/disc-o-bed-cam-o-bunk-cot-with-2-organizers-review/). Been using it for 4 seasons already and it still looks and feels like new. Imagine, we are two 200+ people using the cot once or twice a month and it keeps its condition very well. I also like to take it outside of the tent and transform it to a couch. Simply magic. Of course, you have to have a tall tent. Mine is 6.5 ft. Highly recommended piece of camping gear you wont regret. Hi! What tent is that you have? We have a Coleman 4 man dome tent but thinking about getting the evanston 6. I’m not sure the kid-o-bunk will fit in out 4man tent and still allow two adults to sleep too. Because the sides slope down so far. The tent shown was a 8 person tent we bought at ALDI. I agree that the bunk system won’t fit the 4 person Coleman. We have another 8 person Coleman Instant Tent and there is tons of space. It may fit the Evanston but I can’t say for certain. Best thing is to you check the dimensions of both the tent and bunk system. Great review! The mobile bunk bed looks like it’s worth a try.